Zee Monodee: Tidbit Tuesday: A Funny One! Tidbit Tuesday: A Funny One! Rolling with my word count - clocked down some more this morning, and Chapter 1 is done! Anywayz, speaking of players - this one seems like a true darling! Novak Djokovic is currently ranked world's No2, and he appears to be on the rise to become the next big tennis champion (especially if the rumours are true that Rafael Nadal is considering retirement soon). 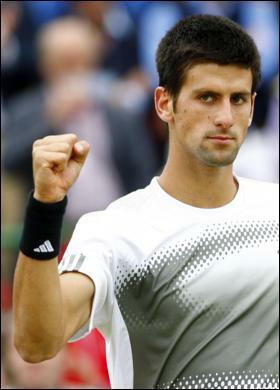 But Djokovic - nicknamed Nole, and/or The Djoker - is not just a brilliant tennis player. He's got a terrific sense of humour, evident in his many impersonations of his fellow tennismen and tenniswomen. Check out this clip - it'll have you in stitches! There's another one here, but the Embed feature has been disabled so I couldn't post it up. Check it out if you have a minute - the impersonation of Federer is to die for!